Policymakers are an important target audience. They must know and understand CTE in order to make informed decisions about the policies and investments that impact CTE. The importance of this audience cannot be overstated, as they have a direct impact on policies such as the Carl D. Perkins Career and Technical Education Act (the Perkins Act), the Elementary and Secondary Education Act and the Workforce Investment Act. It can be difficult, though, to get the attention of policymakers and provide them with messages that have impact. Michigan’s Office of Career and Technical Education took an innovative approach in their communications with policymakers. Michigan used CTE branding to make a quick impact on policymakers. Michigan’s state CTE leaders put together a CTE Legislative Showcase that involved both exhibits and scheduled visits with legislators. Students set up career-based exhibits at the capitol building. Each exhibit aimed to provide policymakers with a better idea of the work students do to prepare for their careers (e.g., culinary arts students provided food samplings at their exhibit). Additionally, CTE administrators timed visits with local legislators so that they coincided with this event. 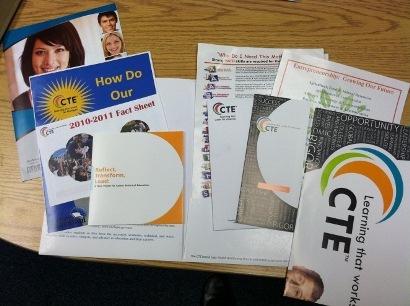 The Office of Career and Technical Education provided every legislator with a packet of information; many of the materials in the packet carried the CTE: Learning that works for Michigan brand. The packets also included free iphone screen wipes with the CTE logo on them. In one day, policymakers in Michigan were able to see the CTE branding materials in their packets, hear about CTE from CTE administrators, and experience CTE in action at the CTE showcase. This was a terrific way to make a lasting impression on policymakers and help them to understand the ways in which they can support CTE. You can create a similar experience in your state. You might plan an event like this for CTE month, or you could time it to coincide with another important event in your state. Consider assembling resources into packets that can be handed out during scheduled visits or showcases. Think of ways to go beyond simply meeting with policymakers, and help them actually experience the power of CTE.